Cruising on water is a totally enticing experience with everything in big ranging right from rooms to decks. While everything being spacious as well as well accommodating, we humans still think big and so always dream of sailing at least once on the largest cruise ship. And today, the competition has grown so enormously that cruise lines tend to have their own largest cruise ship. 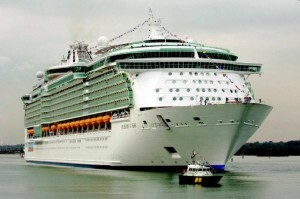 Indicating that the cruise ships are getting bigger and bigger, the vast Royal Caribbean’s Oasis of the Seas is the most recent entry into the industry of cruises, which is physically five times larger if you compare it to the Titanic. Now, the fact is that several largest cruise ships on the planet are from the Royal Caribbean line without veiling the truth that there are more challengers. Here are a few such ships.